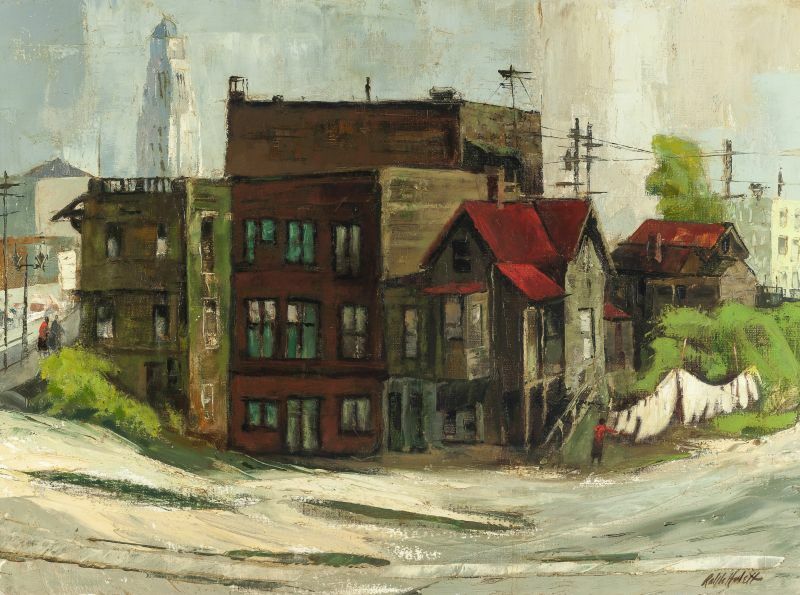 The second of Moran’s biannual California & American Fine Art auctions this year, the October 23rd catalogue is expected to bowl over collectors with a wide array of works by well-known American painters. Primarily featuring works by California-based Impressionist painters, the October 23rd catalogue comprises a curated assemblage of fresh-to-the-market paintings from local private collections and estates. The October 23rd auction date will also feature Moran’s inaugural Women in Art auction, comprising over 100 works in various mediums by female artists from around the globe. Each sale will be accompanied by a full-color catalogue. Works by Southern California artists traditionally dominate the offerings at Moran’s California and American Fine Art auctions. Standout examples by Edgar Payne, Maurice Braun, and Elmer Wachtel (all quite active in the late 19th or early 20th century) are only a few of the highlights slated for sale at Moran’s October 23rd auction. Edgar Alwin Payne (1883-1947 Hollywood, CA), well-known for his plein-air Sierra Nevada mountain landscapes, is featured in Moran’s October 23rd with a view of the San Gabriel mountain Jones Peak. The work, estimated to bring between $40,000 and $60,000, depicts verdant oaks and shrubbery in the foreground backed by the shadowed, purple-tinged mountain range. Putting down roots in Los Angeles in 1882, Elmer Wachtel (1864-1929 Pasadena, CA) was one of the first professional artists to settle in Los Angeles, quickly became well-regarded for his tonalist landscapes. Wachtel is represented in Moran’s October catalogue by a Carmel coastal dotted with eucalyptus trees and red-tinted brush flanking a dirt path leading towards a turquoise bay, and will head to the block with a $3000 to $5000 estimate (PHOTO 1). Also depicting a San Diego locale, San Diego-based artist Maurice Braun’s (1877-1941) view of reservoir Lake Hodges, will also head to the block. Braun’s “Mountain and Lake” has been assigned a $10,000 to $15,000 pre-auction estimate (PHOTO 2). Expected to bring between $5000 and $7000, Paul Lauritz’s summery view of a farmhouse and barn beneath eucalyptus trees is an attractive, painterly example by the artist well-known for his masterful landscapes (PHOTO 3). Sometimes known as “T. Yellowstone Moran” for his prolific documentation of Western landscapes in oil and watercolor, Thomas Moran (1837-1926 Santa Barbara, CA) is represented in Moran’s October California & American Fine Art auction by a watercolor sketch of Yosemite rock formation El Capitan. “El Capitan carries a $5000 to $7000 estimate. Alfred Mitchell’s (1888-1972 San Diego, CA) “In Yosemite” also attempts to capture the grandeur of California’s granite cliffs and is expected to bring between $5000 and $7000. Selections by Northern California-based artists featured in Moran’s October catalogue include landscapes both local and far-flung, such as watercolorist Millard Owen Sheets’s (1907-1989 Gualala, CA) “Late Afternoon Moon on the Nile”, a charming composition depicting two riders on camels making their way along the bank of the river with a full moon overhead is expected to bring $30,000 to $40,000 (PHOTO 4). “Late Afternoon Moon on the Nile” is one of a number of works featured in Moran’s October catalogue hailing from the Estate of Millard Sheets; the works have been consigned by a family member. Theodore Wores (1859-1939 San Francisco, CA) was a prolific artist who painted scenes of Asia, San Francisco’s Chinatown, the Southwest, and the West Coast at large. His 1905 oil painting “Coast Near Santa Barbara”, completed shortly after returning to California after travels to Hawaii, Samoa and Spain, shows a Southern California coastline cast in partial shadow, with the cliffs above rendered in shadowy outline on the sand below (estimate: $10,000 to $15,000). Contemporary painter Ed Mell (b. 1942 Phoenix, AZ) is featured in Moran’s October catalogue with “Sandy Ridge”, a rolling hills landscape indicative of Mell’s fondness for complimentary color theory in his work (estimate: $5000 to $7000). Additional contemporary works include “Moonlit Surf, Jalama Beach”, a charming impressionist oil painting by Santa Barbara artist Dennis Doheny (b. 1956), which carries a $5000 to $7000 estimate. Another Santa Barbara artist, Peter Ellenshaw (1913-2007) is featured in Moran’s October catalogue by one of his quintessential works exploring the interplay of sunlight and water. Dating to 1982, “Caragh Lake, Kerry”, is a large-scale example, and is expected to bring between $8000 and $12,000. Joe Duncan Gleason (1881-1959 Glendale CA), well-known for his exceptional skill with marine and ship subjects, is featured in Moran’s October catalogue with “U.S. Frigate Constitution” (the Constitution is one of the six original frigates authorized for construction by the US Navy) (estimate: $4000 to $6000) (PHOTO 8). Largely self-taught, illustrator and sportsman Arthur B. Frost (1851-1928 Pasadena, CA) is well-known for his en grisaille scenes of hunting and sporting life; one of his rarer works rendered in color, the artist’s oil painting of a bird hunter and his dog will head to the block at Moran’s October auction with a $10,000 to $15,000 pre-auction estimate. Gene Kloss’s (1903-1996 Taos, NM) “Spring’s Around the Corner” is a wonderful semi-abstract landscape in oil, and the artist’s preferred use of white to represent the New Mexican light is on full display in this work (estimate: $10,000 to $15,000). Moran’s California & American Fine Art is scheduled for Tuesday, October 23rd, and will begin at 6pm. Moran’s inaugural Women in Art auction will precede the California & American sale at 4pm. The auctions will take place at Moran’s headquarters in Old Town Monrovia: 145 E. Walnut Ave., Monrovia, CA 91016. Free public preview for both sales are scheduled for Friday, October 19th from 10am to 4pm; Saturday, October 20th from 12pm to 4pm; Sunday, October 21st from 12pm to 4pm; Monday, October 22nd from 10am to 4pm; and on Tuesday, October 23rd, the day of the auction, starting at 10am. Online bidding at Moran’s California & American Fine Art auction is available via Moran’s newly launched app as well as through Liveuactioneers, Auctionzip and Invaluable. Bidding is also available via telephone, absentee and, of course, in person. John Moran Auctioneers will round out their 2018 auction calendar with 20th Century & Contemporary Art + Design and Prints & Multiples auctions on November 13th, followed by Fine Jewelry and Timepieces and Studio Jewelry auctions on December 11th and Art of the American West and Turn of the Century Design auctions on December 12th. Moran’s Prints & Multiples auction is only the second of its kind for the house, and is already shaping up to be a strong catalogue, with works by Robert Motherwell, Norman Parkinson, Joan Miro, Henri de Toulouse-Lautrec and many more making up the offerings. Consignments are welcomed for all upcoming auctions! Visit www.johnmoran.com for information regarding consignment or to view highlights from upcoming John Moran auctions. To contact John Moran Auctioneers directly, email: info@johnmoran.com or call: (626) 793-1833.